PM for reservations !! We are order Chinese Spring Fest course!! Please let me know if you are vegetarian!!! oh and then we have Karaoke afterwards. Last party was so much fun!! Let me organize a next party! 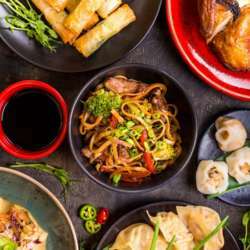 Food is one of the things that the Chinese take the most pride in. And of course, lot of care and thought is put into the menu for the most important holiday of the year. Chinese Spring Festival!! You have to chose one from the list. for example. Vorspeisen Protected content 2 - Nachtisch 1. Time: 20:00 Dinner Start and drink all night!!! What is Chinese Spring Festival??? Chinese New Year, also known as Spring Festival or Lunar New Year, is the grandest festival in China, with a 7-day long holiday. As the most colorful annual event, the traditional CNY celebration lasts longer, up to two weeks, and the climax arrives around the Lunar New Year's Eve. In Protected content New Year festival falls on Feb. 5. It is the Year of the Pig according to the Chinese zodiac, which features a 12-year cycle with each year represented by a specific animal. People born in the Years of the Pig including Protected content , 1947, Protected content , 1971, Protected content , 1995, and Protected content experience their Zodiac Year of Birth (Ben Ming Nian).